For juniors and seniors of various majors, taking a first course in topology. 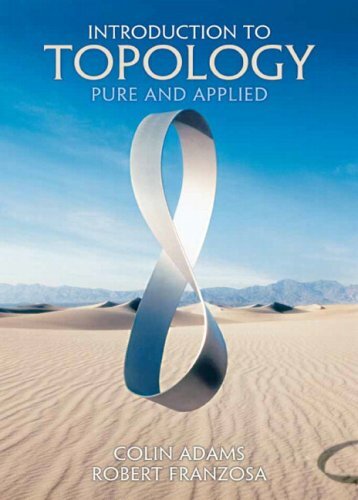 This book introduces topology as an important and fascinating mathematics discipline. Students learn first the basics of point-set topology, which is enhanced by the real-world application of these concepts to science, economics, and engineering as well as other areas of mathematics. The second half of the book focuses on topics like knots, robotics, and graphs. The text is written in an accessible way for a range of undergraduates to understand the usefulness and importance of the application of topology to other fields. Colin Adams is the Thomas T. Read Professor of Mathematics at Williams College. His books include "The Knot Book", "Riot at the Calc Exam and Other Mathematically Bent Stories", and "How to Ace Calculus: The Streetwise Guide". He is the humor columnist for the "Mathematical Intelligencer".